This is a PRISTINE home. This very private home sits on a quiet paved dead end lane and has been created for an exceptional vacation experience. Boat launch, boat rentals, paddle board rentals are nearby. There is abundant parking for all of your water toys and trailers. The fully stocked kitchen has granite counters, all stainless steel appliances, a chefs gas stove, microwave, refrigerator and a large walk in pantry. Storage is not a problem in this cook's kitchen. The eat in nook will comfortably seat 6 or walk out to the deck for outdoor dining. A full size washer and dryer, detergent, dryer sheets, an iron and ironing board are provided. An oversize 2 car garage has room for bikes, skis, paddle boards, wake boards, basketball, baseball. While this home does not enjoy a water view Rollins Lake is around the corner to enjoy water skiing, wake boarding, swimming, kayaking, fishing, paddle boards, tubing, picnicking on the beach it's all here. You can walk our trail to the lake or hike the Stevens Trail or the numerous other beautiful hiking trails that surround this area. White water rafting on the American River or if a slower trip is what you want, raft the Truckee River. Tour historic Coloma where gold was first discovered or visit the Empire Mine where gold was mined and processed and you can relive the miner's everyday adventure of actually descending into the mine shaft. Shopping or sightseeing the historic gold rush towns Auburn, Grass Valley and Nevada City. Come to the foothills and make a new 'Tree House' memory. I have lived in this area for 35 years. Since retirement, we have stayed in many vacation rentals in fun recreational areas. My goal was to create a similar experience in my area for my guests to enjoy. I purchased this home and have furnished it as a home that I would not only live in but vacation in. 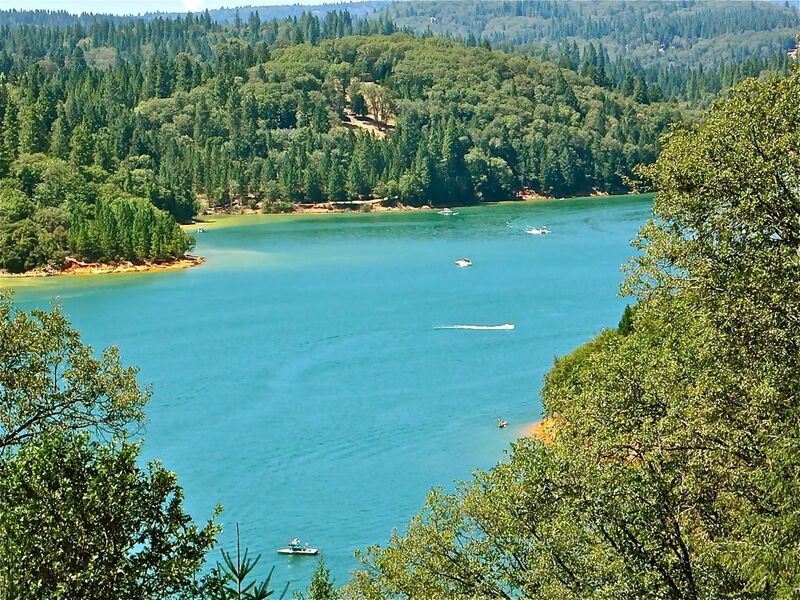 We are in the beautiful Sierra foothills with lakes, hiking trails, snow, deer, turkeys. We are above the fog but below the snow (usually). It just does not get any better than this. Please note......there is no water or lake view from this property. (4) HD flat screens in living room, master bedroom, 2 bedrooms. All are hooked into the satellite system. Regulation horse shoe pit is finished. Let the 'Pitching' begin!! Lovely property and gracious, helpful owners. I rented this property over the Christmas holiday for overflow family visiting from out of state. We found the house beautifully and comfortably furnished and stocked with all the necessities. There was even a decorated Christmas tree which we enjoyed with the entire family. I would highly recommend this home for anyone looking for a rental in this area. We never wanted to leave! We never wanted to leave! This was the best vacation! The house is serene, beautiful, immaculate and stocked with all the comforts of home. The owners are so friendly and helpful, it was so nice having them right next-door if we had a question. The neighborhood is nice and quiet and there was so many beautiful places to go and see throughout our stay-within a pretty short distance. I can't wait to go back! We couldn't have asked for a more wonderful vacation spot! When our 7 year old grandson toured the house he said "This is my dram house!" an opinion highly influenced by the ping pong and foos ball table I am sure. The owner could not have been more gracious. We enjoyed swimming at several different beaches on Rollins Lake and then also made a quick drive to Donner Lake for another great beach experience. I was sad when the vacation was over and we will definitely come again! The best vrbo we've stayed at!! This home is lovely and well appointed! It has everything you will need and more! We felt pampered and very well taken care of! We will stay again!! We have never used VRBO before and didn't know what to expect. From our first inquiry, the Boelsems were helpful and welcoming. Throughout our stay they went out of their way to make things easy for us. Their kindness is something we will never forget. The house is beautiful, comfortable, spacious, and equipped with everything you could ever need. Nestled in the foothills of the Sierras and surrounded by the silence of nature, just opening the door is a joy. At any given time you may see deer or wild turkey wandering through the property or walking beside you along the lane. They call it “The Treehouse” because the house is on the side of a hill, so the spacious back deck is several feet in the air and facing out onto a beautiful grove of juniper and pine. Even though it is in a one-story house with a main entrance at ground level, in the living room you feel like you are up in the trees as you look out on them. It's peaceful and lovely, and truth be told, we never want to leave. We have loved every minute of our time here and can't wait to come back again. Thank you, Linda and Jim. The house is beautiful, comfortable, spacious, and equipped with everything you could ever need. Nestled in the foothills of the Sierras and surrounded by the silence of nature, just stepping out the door is a joy. At any given time you may see deer or wild turkey wandering through the propertyor along the lane as you take your walks. They call it “The Treehouse” because the house is on the side of a hill, so the spacious back deck is several feet in the air and facing out on a beautiful grove of tall trees. Even though you are in a one-story house that has a main entrance at ground level, in the living room you feel like you are up in the trees as you look out on them. We have been here for two and a half months and have loved every minute of our visit. We don't want to leave and can't wait to come back again. Thank you, Linda and Jim. Snow skiing at Boreal, Squaw Valley, Sugar Bowl, Northstar is close. Water skiing on Rollins Lake or Folsom Lake. Sightseeing or shopping in our historic gold rush towns of Auburn, Grass Valley and Nevada City is very popular. Coloma where gold was first discovered is a very educational short trip. Empire Mine tour is open year round but at Christmas is decorated as it would have been in the late 1800's. There are numerous festivals, music events, live theater, horse events, car shows, many many happenings here in the foothills to come and enjoy.